Every year around this time, behind the scenes, I go through my annual Macaroon Marathon, in which I decimate bags and bags of coconut in an effort to find a variation on the lowly macaroon worth noting, publicly. 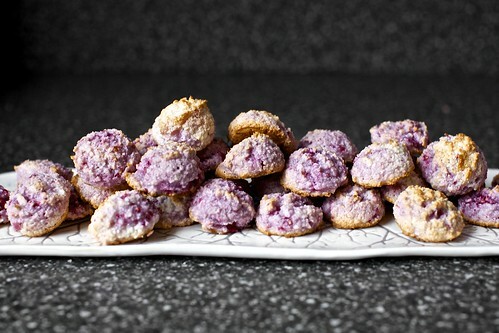 As evidenced by the fact that my archives are virtually coconut macaroon-free, I hadn’t thus far succeeded. But it wasn’t for lack of trying. Two years ago, insistent on making something my coconut-loathing but chocolate-adoring husband would find palatable, I made multiple attempts at chocolate-coconut macaroons. They were… brown. And tangly. And rarely chocolaty enough. I don’t remember them fondly. Last year’s experiments centered on whatever appallingly bad home economics had led me to having three (3!) 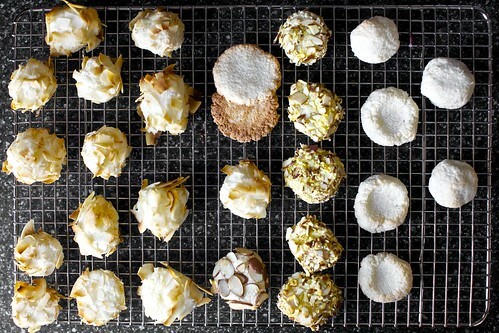 bags of unsweetened coconut in my pantry, and my determination that they would leave my kitchen in cookie format. They were… okay. I am sure more skilled macaroon makers than I make excellent macaroons from unsweetened coconut, but I found them consistently more dry and scratchy than those that began with sweetened coconut. This week’s coconut macaroon trials were the most obsessive yet, with versions rolled in unsweetened coconut chips (gorgeous, but man, are those chips unpleasant to chew), chopped almonds (tasty, but hardly noteworthy), thumbprinted with the intention of filling the indentation with jam or chocolate down the road but I lost interest before I did (a sure sign that they were a snooze) and even flattened, with designs on a sandwich cookie. 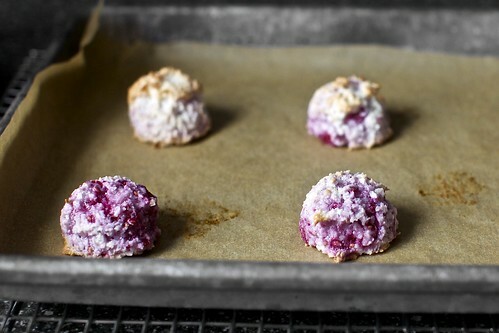 Were it not for the one in which I’d actually pressed a whole raspberry inside a sealed ball of coconut macaroon, I wouldn’t be here discussing macaroons today because although it was fussy and odd to construct, the flavor smacked unmistakeably of cookie destiny: coconut and raspberries were meant to be together. And here, they are. The simplest steps raise these coconut macaroons from the ordinary to something we (admitted) macaroon ambivalents can’t stop snacking on. 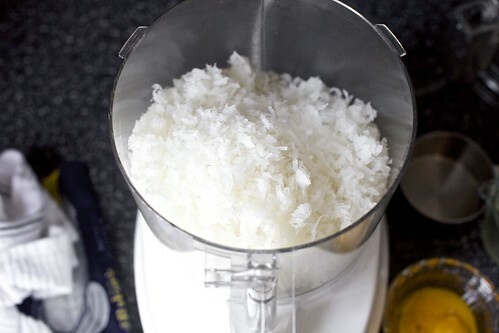 First, I like to grind my coconut in the food processor, reducing the cough-inducing shreds with a thick paste to paste that bakes into a delicately textured cookie. The sugar is kept in check, using less than half of what I saw in some recipes (surely, the combination of sweetened coconut and 1 1/2 cups of sugar is in the running for the 11th plague?). 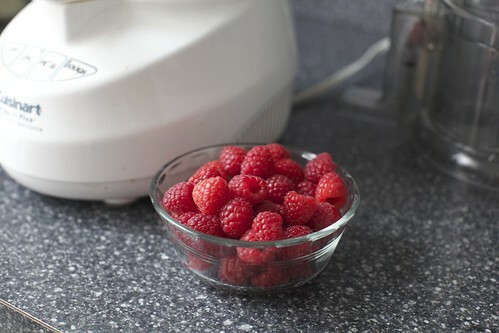 The sweetness that remains plays off the tartness of fresh raspberries, which are not quite pureed but left in little berry blips here and there in a sea of snowy cookie. Almond extract and sea salt fill in the missing pieces and they scooped into little mounds that miraculously stay intact in the oven. (I held my breath.) Once cooled, they really are perfect on their own — tart and sweet tangled together — but I would be unworthy of this microphone you have granted me were I not to tell you how much tastier they are with a drizzle of melted chocolate over the top. But don’t worry, I did not drizzle chocolate over a few out of a greater sense of duty. I did it for the boss. 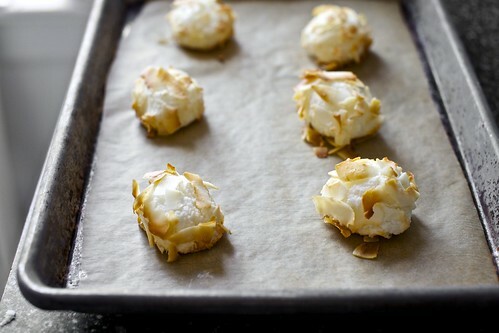 I like traditional coconut macaroons, but I find it difficult to keep their sweetness in check (as there is no butter or flour to absorb the sugar). Tart, fresh raspberries unevenly blended with the batter make for a dreamy pairing; pureeing the coconut (a technique I learned from Cooks Illustrated) makes these macaroons feel light and scratch-free and you won’t even believe how good they are drizzled with melted bittersweet chocolate. (I did a couple, but stashed the rest in the freezer until Passover. I’ll do the rest once they’re defrosted.) The result is my favorite coconut macaroon, ever, one that will hopefully put to rest my Macaroon Marathons, at least for another year. If you’d like to use unsweetened coconut instead — Keep in mind that it’s very hard to guess how much sugar is in sweetened coconut but I might start by doubling the sugar, or possibly going up to 1 1/2 cups (which I’ve seen recommended on almond macaroon recipes that start with freshly ground, and thus, unsweetened, almonds). Theoretically, the 14-ounce bag of sweetened coconut holds 5 1/3 cups of coconut (or so the Baker’s brand bag advertises) but mine clocked in at less than 4 cups and I suspect that fluffing/compressing of the ingredient makes the cup volume vary greatly. 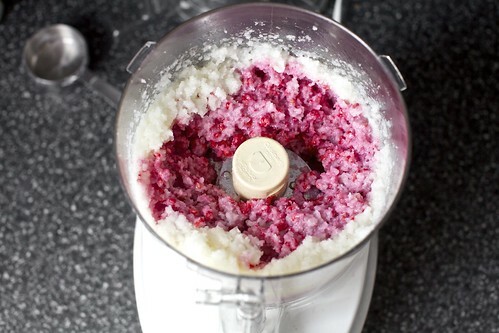 In a food processor, blend the coconut for a minute. 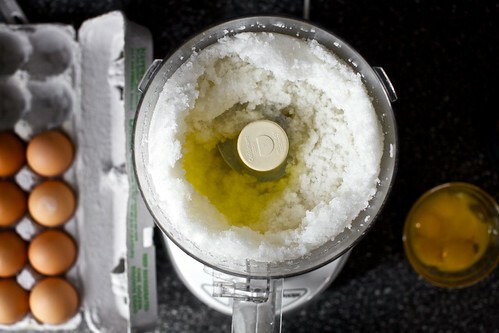 Add sugar, blend another minute. 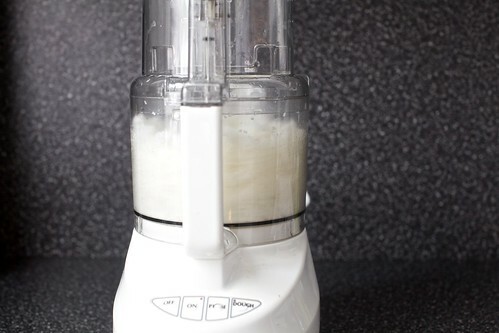 Add egg whites, salt and almond extract and blend for another minute. 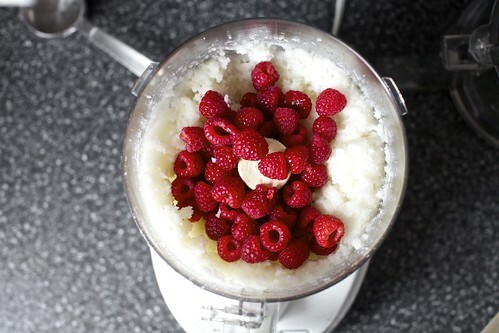 Add raspberries and pulse machine on and off in short bursts until they are largely, but not fully, broken down. (I counted 13 pulses. I might have been a little obsessive, what with the counting.) Some visible flecks of raspberry here and there are great. When you open the machine, you’ll see some parts of the batter that are still fully white while others are fully pink. Resist stirring them together. With a tablespoon measure or cookie scoop (I used a #70), scoop batter into 1-inch mounds. You can arrange the cookies fairly close together as they don’t spread, just puff a bit. 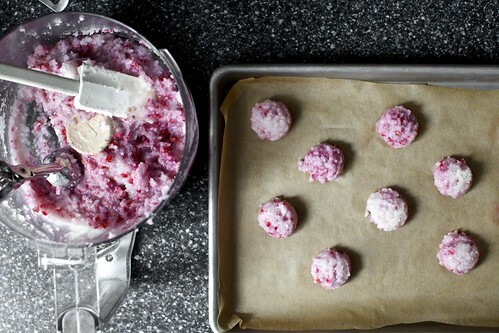 Scooping a little of the pink batter and a little of the white batter together makes them look extra marble-y and pretty. 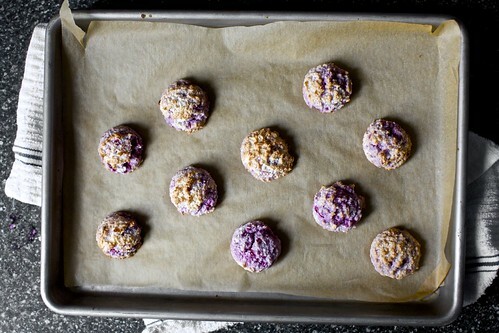 Bake cookies for 25 to 30 minutes, until they look a little toasted on top. Let them rest on the tray for 10 minutes after baking (or you can let them fully cool in place, if you’re not in a rush to use the tray again), as they’ll be hard to move right out of the oven. 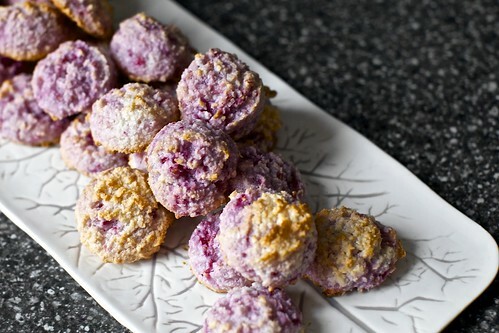 They’ll firm up as they cool, but still remain softer and less dry inside than traditional macaroons. Thank goodness.